Cows are big gentle animals and that’s why we love working with them. A-Z Animals has prepared, provided and supervised cows for upwards of 50 TV commercials, stills shoots, live events. From 50 cows on A stage at Shepperton for a vacuum TV commercial (the most cows ever assembled on a sound stage in the UK) to a single cow on a street in London at dawn for a stills portrait and all the way in between. These two Swiss Milk spots are from the achieves. At the time they were revolutionary in terms of in-camera dovetailing seamlessly with post. As ever we were then and are now, at the cutting edge. 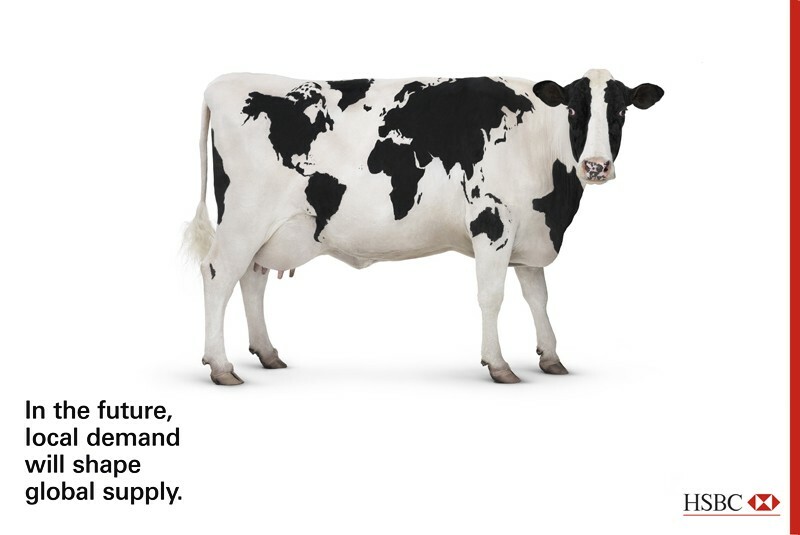 A-Z Animals cast, trained and supervised the cow for HSBC’s global “In the Future” stills campaign. A-Z Animals is regularly asked to train cows for filming. As one would expect, cows are normally in a field and have no knowledge of working up close and personal with cast and crew. This is a good example of one such overseas job. This spot was shot over two days in County Wicklow in Ireland. Gerry Cott travelled in advance of the Unit in order to choose the cows, prepare them over a number of days for the shoot and then transport them to the shoot location. Gerry has done many similar type jobs in the UK, Italy, Denmark, Germany and Cyprus!